Who doesn’t love a world-class holiday without a plane ticket? The words stressed and frazzled will disappear from your vocabulary after taking a Staycation. Just you can’t leave Jeddah doesn’t mean you can’t have a wonderful gateway or even a long vacation. With new luxury hotels, numerous museums and an array of leisure options across Jeddah, a staycation is the ideal solution for a weekend away. From all-out luxury in a palatial resort to endless pristine beaches and oasis of relaxations, there’s an endless list of things to do, places to visit and stay. We all want a place where we want to escape for relaxation, vacation, recreation but we have a limitation of time and usually, we are free on weekends so here come the weekend gateways within your city a place where you can relax, get together for friends and families. 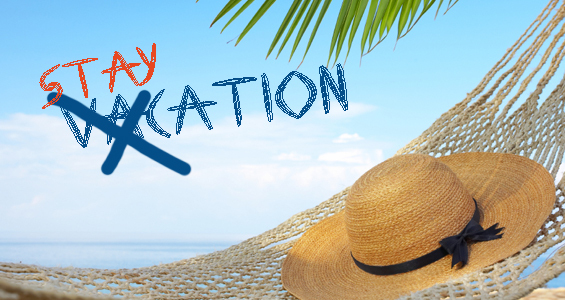 Staycation shouldn’t be stressful-try not to plan too many activities. Experience the new things and explore the city while in Staycation. If you want to laze about in luxury, it’s probably a good idea to go to a hotel. Treat yourself to some pampering at various SPA’s available. Most of them feature a range of massages, body treatments and spa rituals that can rejuvenate, replenish and revive both body and mind. If you are a history lover head off to various historical sites in the kingdom. If you are fancy of adventure or something that helps you stretch the muscles, try out these fabulous activities to pump your adrenaline!!! Go to Jeddah’s coasts and enjoy the sunset and sunrise along with the sound of the rushing waves. Enjoy the beauty of the Red Sea and recreational services at Obhur and new corniche. The Red Sea is rich in coral reefs and colorful marine life. Various diving and snorkeling have been running trips from the main hubs in Obhur. Take scuba diving lessons and head on to enjoy the untouched coral reefs of the Red Sea. Camping experiences in desert offer at least a taste of how the local Bedouins lived and continue to inhabit the desert. At night the skies are clear, displaying a spectacular view of the stars. If a sedate camping experience in the desert is not your things, then there are plenty of activities you can participate in sand boarding, quad biking, Dune bashing etc. Flying clubs are slowly springing opposite Red sea mall and offering so-called flightseeing tours in light aircraft. Saudi is a wonderful haven for the mountain climbers due to its abundance in peak scattered all over the country. Notable places where you can hike or rock climb in Jeddah include Jebel Qamar in Jeddah. Get pampered with top SPAS in town at Assila, Waldorf Astoria, Park Hyatt or Sofitel. History lovers are already well catered for the countless heritage sites of museums and archeological landmarks. So, immerse yourself in the fascinating past with a visit to the quaint sites such as Balad, Naseef house, Al-tayibat museum, Darat Safeya Binzagr Museum and more. 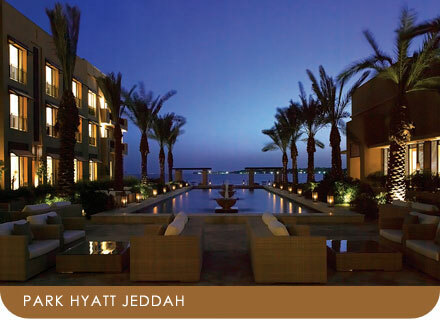 You can always expect a fantastic stay at The Park Hyatt Jeddah which is a secluded sanctuary nestled between the beautiful gardens along the Southern Corniche. Park Hyatt stunning mix of European and Andalusian architecture to make for one of the city’s most modern and spacious hotels with unrivaled views of the Red Sea and King Fahad fountain. The award-winning ladies’ spa Evania offers an ultimate rejuvenation and a perfect place to relax and unwind. Enjoy a light lunch with an abundance of sunlight and panoramic views of the water at any of the hotel’s four restaurants. This is probably the best place to enjoy watching the incredible sunrise and sunset in the whole city. If you are an art lover, this one is for you. Jeddah’s only art inspired resort, this luxury sanctuary houses over 2,000 original artworks by Saudi artists, so walking through its halls feels like browsing through an art gallery. Located right in the center of Al Tahlia, this sleek and sophisticated hotel is Rocco Forte Hotels group’s first endeavor into the Middle East and sister hotel to the popular Hotel de Russie in Rome. It is also home to five restaurants including Jeddah’s first Argentinian steakhouse Pampas and popular rooftop lounge Aubergine. Seeking serenity with Rocco Forte Spa is a perfect escape from the city life. 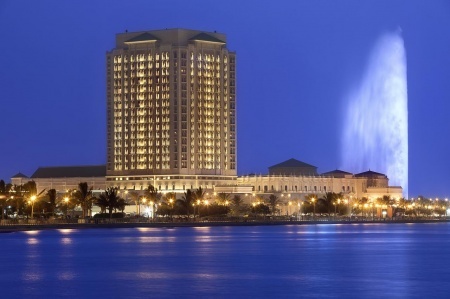 One cannot go wrong with the Ritz Carlton, the most luxurious hotel in Jeddah which is set along Al Hamra Corniche. It overlooks the Red Sea and boasts breathtaking views of the iconic King Fahd’s Fountain. This grand hotel celebrates traditional Arabic design with a modern twist, creating the perfect balance between old and new. Restaurants include all-day dining at Reyhana, the upscale SALTZ, and Karamel lounge. The Spa offers an array of treatments using locally sourced ingredients Ta’if rose and the Red Sea salt which are incorporated into signature therapies. A hidden haven in the peacefully located in KAEC which is an hour drive from Jeddah. Experience total sophistication from the moment you step through its doors! Embraced by the Red Sea on the west and the city’s natural lagoon and mangrove to the east, Bay La Sun is an urban oasis to cater leisure traveler. Restaurants in the hotel offer tailor-made menus and amazing outdoor lounge overlooking the marina. Indulge in a lavish experience with few other recommendations like Rosewood, Sofitel, Ascott, Radisson Blu Corniche. A trip to Taif and Yanbu can be an enticing experience.